In the pre-Hellenic traditions Moon had great importance, equal if not superior to that of the Sun. In fact in India Chandra (the Moon) is considered the main luminary: in the Vedic tradition even nowadays the "Star Sign" is indicated by the Constellation in which, at the time of birth, is located the Moon, and not the Sun. We have seen how the Ptolemaic tradition, taking the seasonal cycles as main reference, considers the Sun the first luminary instead. In this context, the Moon, with its thirteen annual cycles, hardly blends in with the twelve divisions of the solar cycle and thus has found herself to have a secondary role. Proof of this is the fact that most of the people know his own Sign, others also the Ascendant, but few, among non-astrologers of course, know the position of the Moon in their birth chart, and almost none knows the moon phase at his birth. And what do you know of the Moon in your birth chart? 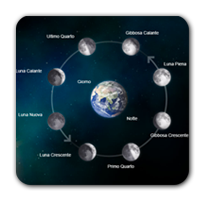 To help you finding greater harmony with our satellite I have included: the lunar calendar of the current month, an introduction to the phenomenon of the lunar phases, directions to the activities best suited each of them. In particular in the lunar calendar you find: the month, the day of the month, the Constellation crossed by the Sun and the Constellation in which is the Moon, the lunar phase and Vedic lunar mansions (nakshatra) express by numbers. If you want to deepen the value of the Moon in your birth chart ask Bashir an astrological reading. The cycle of the aspects that the Moon forms to the Sun and the Earth is called the sinodic lunar cycle, or lunation, lasts 29 days and half and is traditionally divided into eight stages. Each of these phase produces different effects on the life cycles of our Planet. The tides and all liquids in general (from the sap of the plants to the glandular secretion of animals and humans) are deeply influenced, as much as the intensity of bacterial life and the stages of growth (of plants and even of infants). Traditional agriculture respected these rhythms; The industrialized farming put them aside, but had been re-evaluated by the biodynamic cultivation. Winery requires great attention to the phases of the moon as indicator of bacterial activity. Industrial production, pasteurizing the wine, can avoid to care, but the result is not the same. The Moon, in its orbit around our planet, is continuously differently illuminated by the Sun; it follows that, seen from the earth, his body appears cyclically illuminated and darkened. Each phase corresponds to a particular angle to the sun and consequently to various astrological aspects. The lunar cycle is traditionally divided into eight phases for which hereafter are given directions to the most appropriate activities. the Moon is in conjunction with the Sun. Sets and rises with it, so it not visible. Highest tides. This phase lasts two or three days in which the external activities should be reduced, the physical energy tends to calm down but the subtle senses sharpen. The inner silence is preparing the ground for the revival. Period suited to retreat, meditation or High Magic rituals. This conjunction of the Luminaries is also called Unio Mystica (mystic union). it goes from New Moon to First Quarter. The first thin slice that appears at sunset two or three days after the New Moon in India is called "Shiva Moon" and by the Egyptians was once defined as "First Light", is in fact it is the beginning point of the ancient lunar calendars. This day is suitable for laying the foundations of new activities. The following days are the beginning of the expansion and the fertility of the earth. Good period to begin work in the garden for plants that produce above ground. the Moon is at 90° (square aspect) from the Sun to the East, aged about seven days. The moon continues to move away from the Sun and the tides fall. These days are important to confirm and make manifest and well accepted our initiatives. The bacterial activity increases, the sap flows, it is a time of growth. Dedicated yourself to what you want it to grow: you sow, you cut your hair, develop projects. The portion of the illuminated disc is now more than half. From the First Quarter to Full Moon it is considered a "hot" moon phase. This particular heat energy is dynamic, able to create movement, passion, intensity and to promote stages of growth and expansion. Bacterial activity increases and with it the risk of infection or inflammation in the case of cuts or interventions. Moment for action driven by desire for success. the Moon is opposite to the Sun and appears fully illuminated. Age 14 days. It 'a magical moment: people, animals and plants perceive this force. It is a moment of fullness and celebration. The strong pull of the Moon combines with the solar one to produce maximum tides and maximum influence on liquids; particularly sensitive people may feel imbalances in glandular production; generally everyone all perceive a kind of excitement. It is scientifically demonstrated that sleep is disturbed. In these days the delivery rooms are crowded, the wounds bleed more, inflammations give no truce. Days not advised to proceed with surgery. Suitable for the exhibition of the crystals moonlight and for healing rituals. between the Full Moon and the Last Quarter. With the start of waning tides are lowered again and the lifeblood gathers again inside, towards the roots. Begins the phase propitious for all that no longer needs to grow or that must mature or end. Period appropriate interventions and treatment of inflammation, to stop or terminate relationships. For the storage of products of the earth, to decant the wine and to shave. the Moon is again at 90 ° from the Sun, so it rises and sets 6 hours before; age 21 days. The phase of the last quarter is a time of sifting, sorting, selection and strict verification. It is then that you start the process of identification and elimination of what has become obsolete and it is necessary to remove, ignore, or forget overcome. Pruning plants. They are also favored activities that facilitate detoxification and purification. Among the Last Quarter and New Moon the illuminated portion of the Moon continues to decrease again showing a small scythe facing West. Energy is the exact opposite of that which characterizes the phase of the Moon Hot; and 'a phase of preparation for the withdrawal period and therefore suitable for purification steps to what' invites us to meditation and concentration; not 'the time to look for expansion. Good to cut timber. You can download the table of lunar phases in the DOWNLOADS section.